Such questions prompted Yasheya to think of creating a worldwide minerals supply chain with an embedded commercial logistics system. To build such a system from scratch was deemed rather expensive, so it was decided to buy a standard transportation system for sea terminal administration and add some specific features to it. After much searching, INPLAN GmbH, of Oberhausen, Germany emerged. INPLAN, and its US partner Logistics and Port Management Americas LLC, are specialised in providing logistics, port, raw material, and warehousing IT solutions. Yasheya has successfully been co-operating with INPLAN for the last five years and have jointly developed a state-of-the-art web based IT system for the group’s logistics. 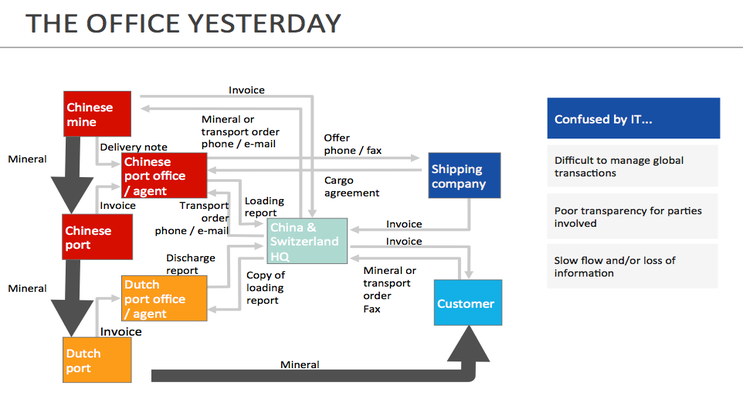 The systems main functions include: management of trade, freight orders, and transport capacities; planning of transports; stowage planning; time scheduling; warehous- ing at all logistic locations; management of all costs and revenues; invoicing and monitoring of payment transactions. The system was developed so that all of the above is available 24/7 worldwide for all involved parties, ie. trade partner, logistics partner, and customer. This knowledge is accessible by every Yasheya cargo agent and back office employee, worldwide and realtime. For example, the very moment a vessel with a mineral cargo leaves a Chinese sea terminal it is registered by Yasheya’s clerk in the USA who can then inform the client about the ETA at the US port. The software knows the most important ship- ping companies and their schedules; it also knows their vessels’ capacities, the number of holds, and the suitability of the ships. The system also remembers the costs for cargo with this ship from former agreements. If Yasheya has no intelligence on that vessel or its costs, the system encourages a Yasheya clerk to make some enquiries about it. 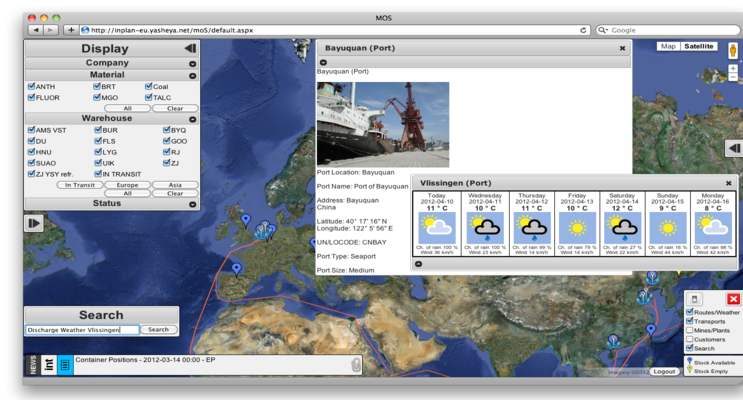 The software also knows all about possible minerals cargoes for a given date, from a specific port to all destinations in question. Usefully, it combines planned transportations with ETA of vessels on-hand and presents the results to the Yasheya supervisor, who then checks the generated plan, adds any required input, and sets the plan in operation. The system will make a stowage plan either for a whole vessel or just for a rented hold, it will check if all cargo is loaded and it will register all transshipment or transport related information – not just as data but also as copies of documents or photos or even as video sequences. So a customer can watch a video of the loading process of its commodities seconds after the hatches are closed. During the voyage, IT asks for the vessels’ position and alarms a Yasheya clerk if anything seems to be awry. 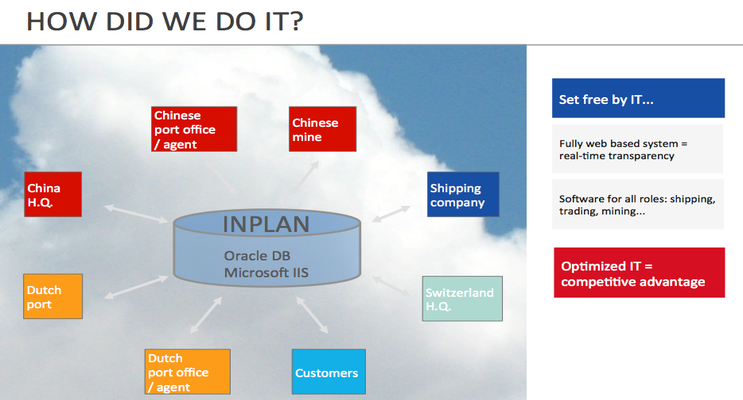 INPLAN was founded in 1989 in Germany and focuses on developing software for transport and purchasing logistics. 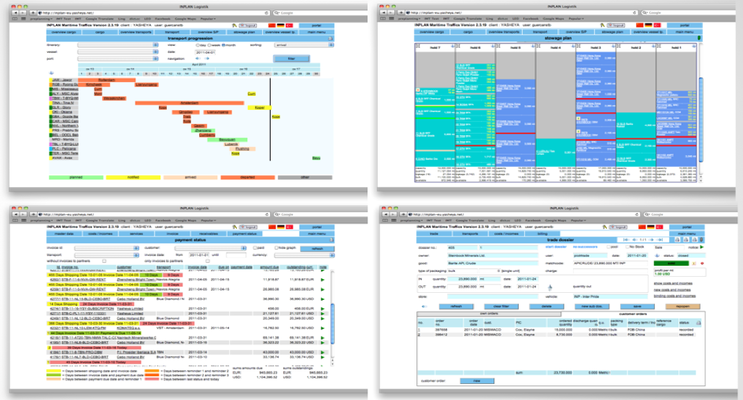 INPLAN's main software products include port management, navigation, purchasing and real estate.